Mounting a backboard above your garage door might be the budget-friendly option, but investing in a portable basketball hoop has many advantages. 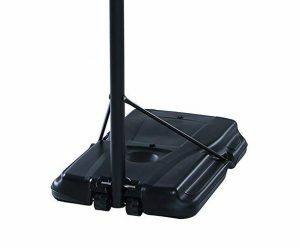 Portable basketball hoops can be moved around with relative ease, have their rim height adjusted and be packed away when needed. Overall, they offer you more convenience, flexibility and versatility than mounted or in-ground basketball hoops. There are many popular brands competing in the portable hoop market today. Spalding, Silverback and Lifestyle are the most popular, but other brands have also produced some great ones. You might think that any 10-foot hoop will do the trick for all intents and purposes. However, that simply isn’t the case. Besides the basketball and playing surface, the hoop itself heavily dictates your basketball experience. All of the portable hoops you’ll find in our roundup, including the cheaper ones, are perfectly suitable for recreational play. However, increasing your budget will make for a more enjoyable playing experience. Here are the factors that determine the usability, quality and price of a portable basketball hoop. Every portable basketball hoop has a base size, measured in gallons. These bases are filled with water or sand to weigh down the entire hoop and keep it grounded. The size and form of a base determines how stable the hoop is. Expensive hoops will have even bigger bases, partly to provide additional support and partly because the entire hoop weighs more. Just keep in mind, bigger is not always better, especially if you’re going to move it around often. The support pole is what connects the base to the backboard. A strong support pole provides better overall stability. You’ll find most support poles either come in three-piece or two-piece configurations. The top-end portable hoops are more likely to come in two-piece configurations. Two-piece configurations are slightly less portable but have less bits and moving parts and are therefore more stable. Another important consideration is the height-adjustment range. Most portable hoop heights can be incrementally adjusted – perfect for the kids or when you want to practice dunking on a lower rim. 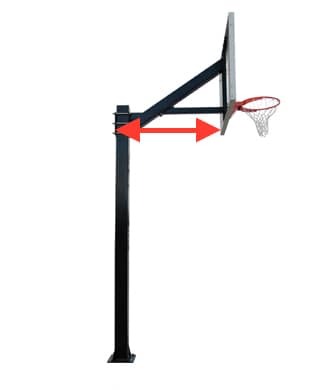 Overhang refers to the distance between the front of the post and the front of the backboard. This is important because you don’t want to be crashing into the support pole when you’re playing deep. 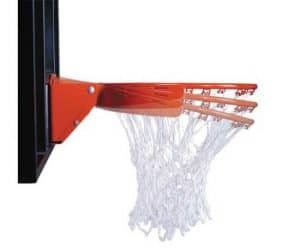 The cheapest hoop systems have the backboard directly attached to the support pole, meaning there is effectively no clearance. More expensive systems will have greater clearance, giving you the freedom to move around under the goal. In NBA games, backboards measure a massive 72-inches wide. You can’t really get portable basketball hoops with backboards that big, but generally speaking: more expensive hoop = bigger backboard. Bigger backboards make it possible to land more bank shots and get more rebounds. You generally want the backboard size to be at least 52-inches wide to prevent things feeling a little awkward around the board. Also take note of the shape of the hoop’s backboard. A straight edge, rectangular backboard is preferable to an oval or fan-shaped one. 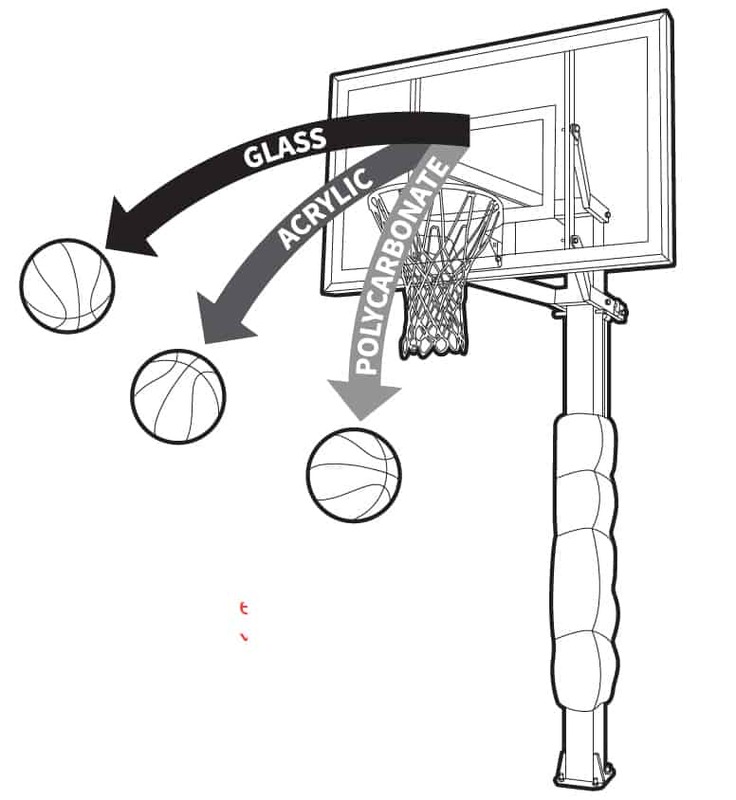 Backboards are typically constructed from polycarbonate (plastic), acrylic, or tempered glass. Cheaper hoops come with polycarbonate backboards which are fine for all intents and purposes. However, they lack the rebound qualities of higher quality material backboards. In other words, the rebound might feel flat and unnatural. Furthermore, polycarbonate backboards also become brittle in around 3-5 years. Their lifespan is significantly shorter than acrylic and tempered glass backboards which last 10-20 years. Acrylic backboards provide a better rebound than polycarbonate backboards. Balls will bounce off these backboards very nicely, and they are relatively lightweight. Glass backboards provide a bounce that matches what you would expect from a professional hoop. You’ll see them in college and professional basketball games. They produce the least amount of vibration. The main downsides are their higher price tag and heavier weight. The backboard material provides a good indication of how well the ball will rebound. However, keep in mind the quality can vary within each material. You will find some more expensive polycarbonate backboards can rival or even beat a cheaper acrylic backboard, for example. While the rim itself will always be sized according to the 18-inch diameter specification, there is variation among the way the rim is attached to the backboard. Standard rims are screwed directly onto the backboard. Standard rims have the advantage of being cheap, strong and reliable. Higher end hoops feature Compression breakaway rims which feature springs inside the bracket. That means there’ll be some nice cushioning each time you hang on the rim after a dunk. Compression breakaway rims should only be seen as an important factor for those that dunk, as otherwise it doesn’t make any difference. Search for hoops within this budget and you’ll be finding most hoops to be youth-sized. Perfectly fine if that’s what you’re after, but that’s not what we’re covering in this roundup. 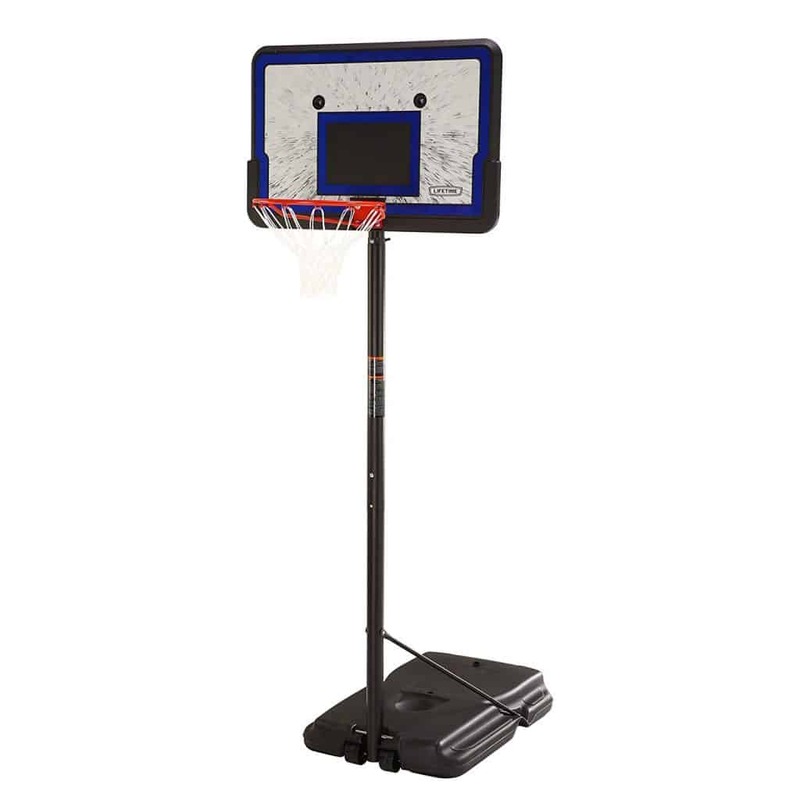 However, one hoop that stands out (and is really the only option at this price point) is from popular budget brand Lifetime – The Lifetime 1221 Pro Court W/ 44-inch Impact Backboard. This hoop has a support pole with a fairly simple telescoping mechanism – allowing it to adjust from 7.5-feet to 10-Feet in 6-inch increments. It therefore goes all the way up to the regulation height while also being suitable for youth ages 8+ basketball. The so-called ‘Impact’ backboard is designed to be ‘virtually unbreakable’. The plastic backboard feels rock solid and very durable, but it has a particularly dull bounce that leaves much to be desired. Being a small 44-inch backboard, a lot of shots will hit the corners or miss it completely. The base only has a 27 gallon capacity which means it isn’t particularly well grounded. Adults will easily bring the whole thing down if they hang on the rim at its 10-foot setting, so it’s not suited for players who possess a strong aerial threat. Finally, the backboard attaches directly onto the support pole, offering zero clearance between the two. It can be very frustrating to be obstructed by the pole when playing around the net. Assembling the Portable Lifetime Pro Court System will take around 1-2 hours, and 2 people are recommended for setup. Assembly isn’t too difficult, but some people have complained about low quality parts having to be replaced. Overall, The Lifetime Pro Court is fine for a bit of fun and realistically the only option for a 10-foot hoop under $100. On the official Lifetime store it goes for $179.99, but it’s available for just $79 at Amazon and Walmart. For under $200, options are still very limited. The Lifetime 1269 is our pick in this price bracket. Essentially the same as the 1221, you’re probably asking why it costs an extra $100 or so. The only real difference is in the 44-inch fusion acrylic backboard. The clear acrylic backboard is stiffer, producing a far better rebound and better bank shots than the 1221. 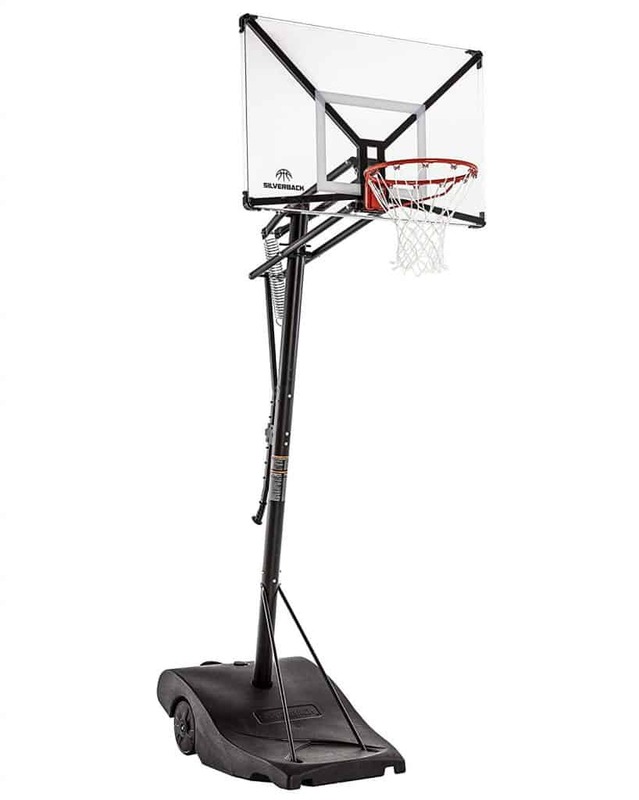 The backboard’s bounce characteristics are up there with high-end systems, but when all is said and done, it’s only 44-inches wide and the rest of the portable hoop is no different to the much cheaper 1221. As soon as your budget breaks the $200 mark, there’s a sudden jump in quality with the extremely popular Spalding Pro Slam 66291. The Spalding Pro Slam’s technical specifications are those you’d expect in premium portable hoops that cost a lot more. The polycarbonate backboard is 54 inches wide, so it’s big enough for those that want to practice bank shots and grab more rebounds. Another premium feature is its breakaway rim. Rather than having the rim directly bolted onto the backboard, a spring mechanism is in place to cushion the impact of grabbing onto the rim. For people who want to practice dunking, a breakaway rim is practically mandatory. The angled support pole is also a very nice touch. It provides some much needed clearance between the backboard and backboard, ensuring more enjoyable play under the net. While these impressive features would seem to make buying it a no-brainer, there are some things to be aware of. First, because it has a lot of small parts (even more than some of the more expensive hoops), assembling it proves to be quite a challenge. It will take around 5 hours or longer in total. It’s definitely a weekend job, and you’ll want some help from friends or family. If you are not confident in your own ability, the expert assembly service might be worth it. Secondly, the 54″ backboard is constructed from polycarbonate, meaning the rebound is rather flat. Many people won’t notice this, but more serious players most likely will, meaning the hoop doesn’t quite cut it for those at the enthusiast level. Note: Amazon mistakenly listed the Pro Slam as having an acrylic backboard, but customers were receiving polycarbonate backboards. The listing has since been corrected. Premium features at a budget-friendly price point go a long way in explaining why the Pro Slam is the second best-selling 10-foot portable basketball hoop on Amazon. Close to the $200 mark and with no serious competition in the price bracket, it’s a great buy for those not quite ready to make a more serious investment. 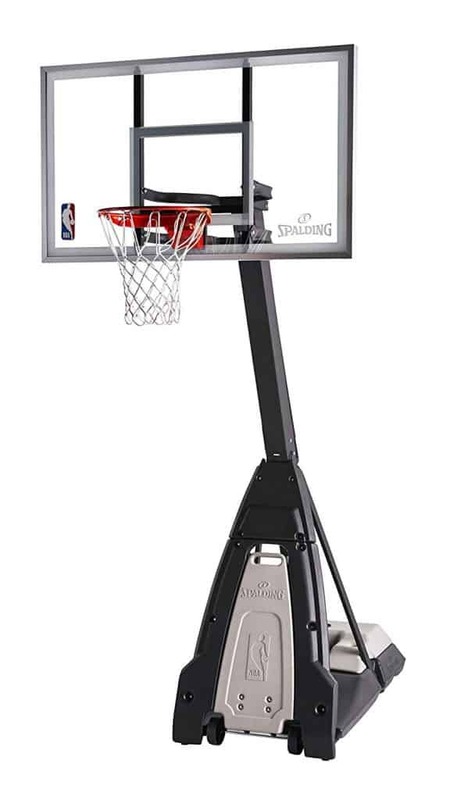 The Spalding NBA Hercules Portable Basketball Hoop is essentially the Pro Slam’s older brother. The support pole setup is fundamentally the same, but you get a much nicer acrylic backboard and a slightly bigger 37-gallon capacity base. Don’t let the Amazon reviews fool you – sift through them and you’ll realise most of the negative reviews concern missing parts or a complicated assembly process. Once setup, the NBA Hercules is a great hoop. Feature-wise the NBA Hercules is excellent. It feels well grounded but the 3-piece support poles are a little thin and a hassle to setup. We would seriously consider getting professional assembly to save you any headaches. The Silverback NXT 54″ portable basketball hoop is one of our favorite mid-range portable hoops. On paper it’s not any better than the cheaper Spalding hoops, but when you get your hands on it, the difference is quite obvious. Firstly, the build quality is much better. While the similarly sized Spalding Pro Slam weighs 100 pounds, the Silverback NXT comes in at roughly 150 pounds. The support poles are thicker, the base is stronger, and there’s fewer parts you need to deal with. In fact, one of its selling points is its simple 90-minute setup time. Compared to other ‘portable’ hoops, the NXT’s unique wheelbarrow lift and roll design mean it actually is easy to move around. The wheels are bigger, meaning you can also move it over rougher terrain without too much difficulty. The engineering behind the NXT is impressive for a $500 hoop. A 35-gallon base is nothing special, but this one features a steel frame sub-structure that runs within to provide some extra stability. It does still rattle a little, but it can definitely take a beating. The acrylic ‘Infinity’ backboard is frameless, giving it a nice look and more consistency around the edges. We’re a massive fan of the aesthetic, and the rebound is fantastic. Finally, the hoop features an impressive 26″ overhang, meaning there is plenty of free room to roam directly beneath the goal. 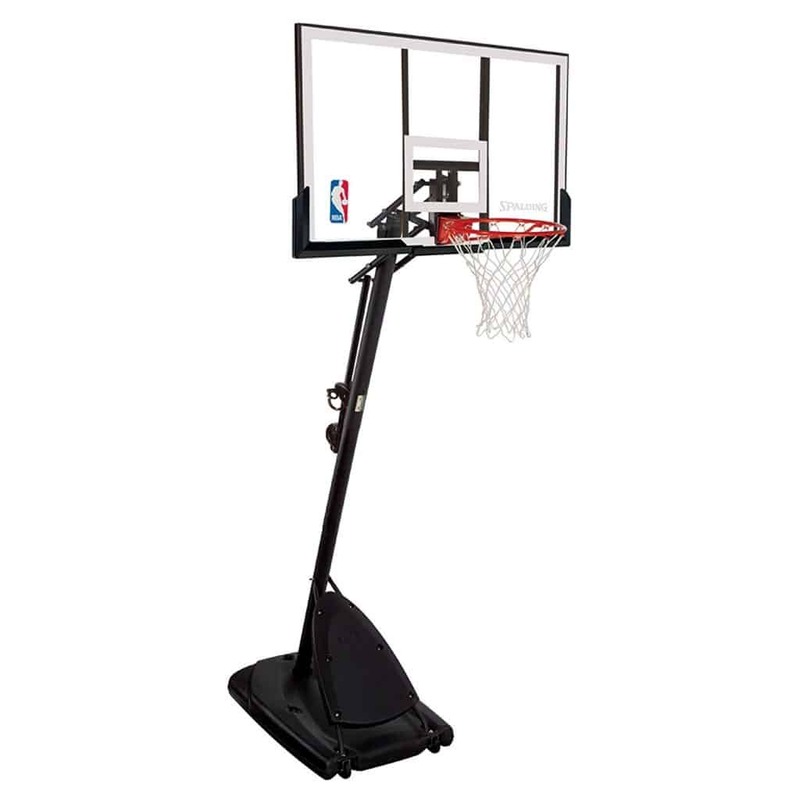 Overall, the NXT is an excellent choice for a mid-range basketball hoop. Superior build quality, great stability and a perfectly acceptable 54″ backboard. It just gets everything right. The Silverback NXT is also available with a 50″ backboard setup for $100 less. However, we’d strongly urge going for the 54″ setup as 50″ feels a little small. Unlike the cheaper Spalding portable hoops that have questions surrounding build quality, the Spalding 54″ NBA Glass Backboard Portable Hoop System is a completely different story. For under $600 you get fantastic build quality, great stability and best of all, a tempered glass backboard. 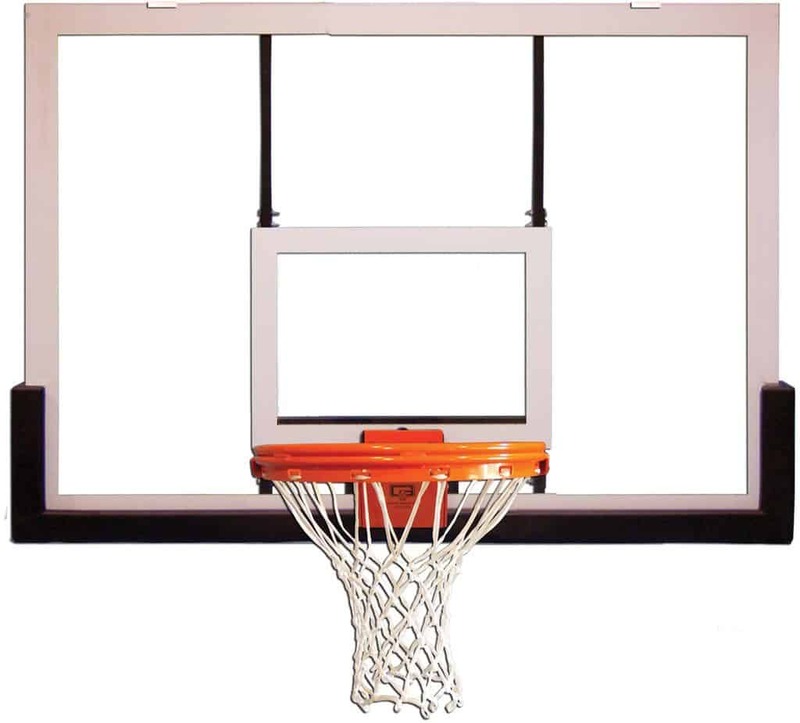 Tempered glass backboards are used in professional basketball leagues. With this hoop you’ll get a bounce much more comparable to the kind you’d expect in NBA games. The thick support pole and 40-gallon base means the stability is top-notch, even with the heavier glass backboard. The screw jack mechanism makes for simple height adjustment. The hoop is heavy and not exactly easy to move around, but that shouldn’t be a problem unless you plan on moving it around a lot. Right now, we feel like this is the best mid-range hoop around. You simply can’t find other hoops in this price bracket that feature a glass backboard and the level of stability found in the 54″ hybrid hoop. The Spalding 74560, a.k.a. “The Beast”, is at the top end of consumer-grade portable basketball hoops. The biggest feature is its 60-inch tempered glass backboard. Very rarely do you find a portable basketball hoop with a backboard bigger than that. To make sure the whole system stands firm, it’s grounded by a massive 55-gallon base. It’s two piece, 5-Inch square angled pole system adds to its sturdiness. It features Spalding’s acclaimed Pro Image Breakaway rim that is commonly seen in NCAA play and worth $80 alone. You might ask whether it really makes any sense to splurge another $500 to get the bigger backboard and increased stability. That’s something for you to decide: For serious play a 54″ backboard is very acceptable, but the extra 6-inches The Beast provides is definitely noticeable. Overall, if your budget can be stretched, “The Beast” is the way to go. However, it might be overkill if your playing surface is small. You won’t get much out of a 60″ backboard if you’re limited to playing in your small driveway or backyard. Note: Amazon provide free assembly for “The Beast” which normally costs around $100. Since we’re dealing with portable basketball hoops, placement is quite flexible. The backyard or driveway are the most common places. Just make sure the surface is flat and the surrounding play area is big enough and away from any potential danger. Portable basketball hoops are designed to last for years and even withstand harsh weather conditions. However, the plastic base is usually most vulnerable to damage. They are susceptible to cracking, in which case they need to be repaired or replaced. The support base is typically filled with either water or sand. Water is quick and convenient, but it weighs less (given the same volume) and can evaporate over time. Another drawback is water can freeze during the winter, cracking and permanently damaging the support base. Make sure to empty the water or add antifreeze when the weather is cold. Sand is typically the recommended option. Sand weighs around 13 pounds per gallon (compared to water’s 8 pounds per gallon) providing extra stability. There’s also no chance it will freeze, so that’s one less thing to worry about. However, filling and emptying the support base will be more of a hassle. Another option is BaseGel. BaseGel mixes with water to produce a heavy gel that is an excellent filling for support bases. Unlike water, it doesn’t suffer from freeze-thaw cycles that damage the support base. Choosing the right hoop can appear daunting at first. However, when you really ask yourself what you really need – and what your budget is – it’s actually pretty simple. 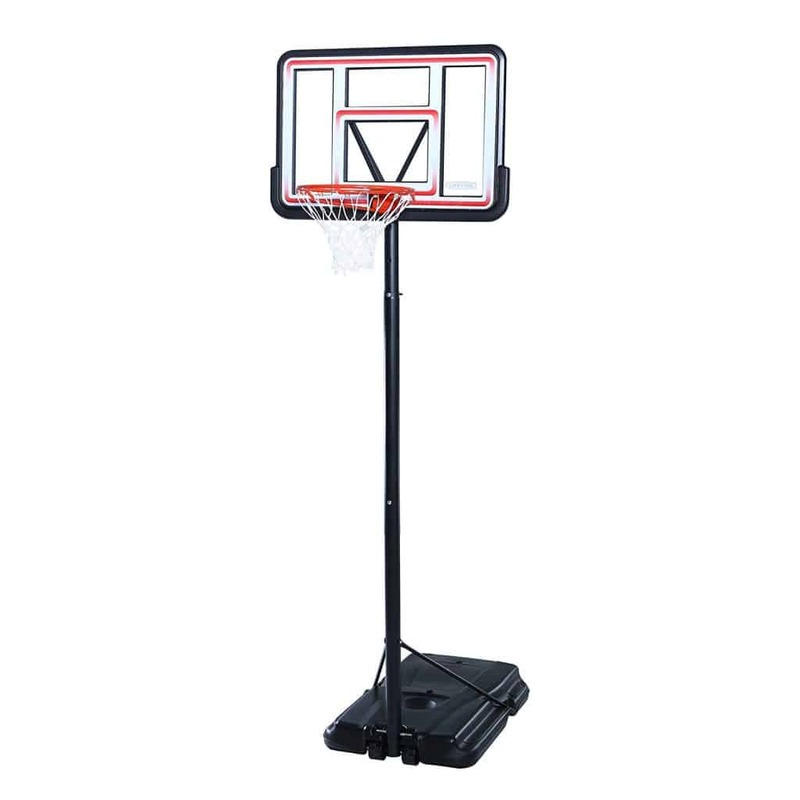 For those purchasing a basketball hoop for younger kids, the Lifetime 1221 is a great choice. It’s light, easy to stash away and future proof: It will see the kids grow into it, all the way from 8-foot to the 10-foot regulation height. For those on a tighter budget but after something a more serious, the Spalding 66291 is the best option. You get a big 54″ backboard, angled support pole and breakaway rim – features you simply won’t see in other hoops in the same price range. Just be prepared for a rather complicated assembly process – many people have experienced headaches setting it up in the past. While similar, the Spalding Hercules Hoop might be worth the extra cost – just to get that much nicer acrylic backboard that produces a better rebound. At the mid-range, you are spoilt for choice. The Silverback NXT is an incredibly solid all-rounder. A 54″ acrylic backboard, impressive 26″ overhang and solid build quality make for a very good purchase. However, you might be tempted to spend extra and get the excellent Spalding 54″ glass backboard hoop system. The tempered glass backboard provides a superior rebound, and the larger 40-gallon base provides a little more stability . If your budget permits, look into the Spalding’s “The Beast”, a hoop that features a massive 60″ glass backboard and packed with other top of the line features. The free assembly service from Amazon is a nice bonus, too.